Are blueberries in abundance where you live right now? They are everywhere here in New England. Every grocery store has a special on them, and because I just love these juicy little berries, I cannot resist buying pint after pint. This leads, of course, to an abundance of blueberries not only in the grocery stores, but in my refrigerator as well. So what do I do with all of this delicious fruit? (Let’s face it, there are only so many smoothies one can drink :o)) I immediately thought of making blueberry muffins, however, I had just made some banana muffins the other day, and decided we did not need 24 muffins sitting around the house; that’s just asking for trouble. Thinking a little outside the box, I decided to use my favorite fall recipe for apple crisp, and transform it into a summer treat, instead. 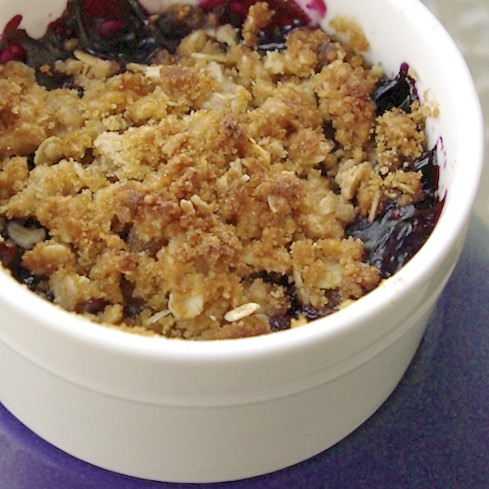 Yep, blueberry crisp. It. Was. Awesome. A sprinkling of sugar adds the perfect sweetness to your berry filling, while a bit of cornstarch thickens it just enough. Then, of course, you have the classic brown sugar and oat topping, which provides a wonderful crunch atop the warm blueberry filling. If it suits your fancy, top your serving with a scoop of vanilla ice cream, or a dollop of whipped cream, and indulge in this perfect, easy, summer dessert. What is your favorite way to eat blueberries? Let me know below! Paula’s Notes: You can make this recipe in one 8×8 pan, or in 6 7-8 oz ramekins for individualized desserts. Spray one 8×8 pan or 6 individual 7-8 oz. ramekins. In a medium bowl, gently toss blueberries with lemon juice, granulated sugar and corn starch. Transfer berries to baking dish or evenly distribute between ramekins. In a separate bowl, use a fork or spoon to thoroughly mix the brown sugar, flour, oats, vanilla and butter. Sprinkle oat mixture evenly over the berries. Place dish(es) on a baking sheet, and transfer to a preheated oven for 25-30 minutes, or until berries are bubbling and the topping is golden brown. Serve warm and top with ice cream or a dollop of whipped cream, if desired.